§ September 19th, 2005 § Filed under market crash, valiant Comments Off on Deathmike. As I’ve mentioned previously on this here weblog, one of my projects at the store lately has been going through dead stock in the back room. We have a buyer who just wants to buy a lot of comics in bulk, and doesn’t care what they are…we’re not getting much for ’em, but “a little” is better than “the nothing” we were getting for them before. Plus, we’re freeing up lots of valuable store space, and that’s the half-full cup I’m focusing on. The vast majority of the bulk comics we’re unloading are from the early ’90s, that crazy period when comics were booming, recent back issues were selling like you wouldn’t believe, money was coming in by the crateful, and these good times were never going to end, never! Well, they ended, all right, with promised blockbusters not busting a darn thing, and the collectors/investors that were driving the inflated comics market bailing out and buying, I don’t know, Beanie Babies or some darn thing instead. One of those comic market bombs was the much-ballyhooed Image Comics/Valiant Comics mini-series Deathmate , which I mentioned briefly before. As I noted, a crossover between two red-hot companies was sure to be a sales success, and most stores ordered accordingly. However, it ended up tanking, whether it was due to its erratic shipping schedule, lack of the more popular Image characters (like Spawn), or just plain awfulness, it’s hard to say. Actually, it’s not hard to say…it was all three, surely. My plan for this weblog today was to gather together a full set of Deathmate , read the series from beginning to end, and do a (hopefully) light-hearted and fun review of the comics, and we could all have some fun reminiscing about this strange time in the comics industry. However, to pull the plan off, I would have to read the comics in question. And you know what? They’re really, really bad. They’re like the epitome of what early ’90s “hot” comics were like…barely competent art, extremely sparse plots that still managed to turn into jumbled messes, laughable dialogue. I managed to give a full read to the first couple in the series, but could only manage to skim the rest. The overarching “plot,” as it were, of the series was that Solar (from the Valiant Universe), heart aching from the loss of his life-long love, flings himself into a some kind of interdimensional limbo and finds the WildC.A.T.s’ Void (from the Image Universe). The two of them get down with some cosmic lovin’, and as a result, the two Universes are merged, and the rest of the series is characters running around shouting at each other that something is wrong with reality. The best part of Deathmate (and by “best” I mean “oh, look, the dog poop on my shoe isn’t so thick by the heel”) was probably the first story in the Prologue, which is at least is by Bob Layton and Barry Windsor-Smith (inked by Jim Lee), so it’s at least competent. It is a nice companion piece to the generally excellent early issues of Valiant’s Solar series, in which Solar’s companion Gayle asks him to stop extending her life with his powers…to let her die. It’s affecting, in its way, and kicks off the whole “Solar seeks companionship with ultra-powerful cosmic being” thing I mentioned earlier. It’s a bit more complicated than that — isn’t it always? — but that’s the gist of it. Now, as for the rest of the series…lemme explain first, for those of you blissfully ignorant of how this whole Deathmate thing worked. Instead of issue numbers, which would have made things easier, the issues are identified primarily (har har) by color. The Prologue and Epilogue issues have silver foil covers, and the other issues have blue, black, yellow, and red foil. There are also variant covers, of course, since this was the ’90s, but I’ll get to those later. The foil cover on Deathmate Yellow is probably the worst of the bunch. Scanning it doesn’t do it any justice…I tried, these guys tried, but nothing quite properly conveys the piercing, acidic yellow on this cover. Sunday at the store I was packing up a pile of these for the bulk sale, and that yellow actually started to make me physically ill. And no, it wasn’t the thought that we dumped so much money into this comic…I was having an honest-to-God reaction to that horrible, horrible shade of yellow. I’ve no explanation. And, yeah, that’s pretty much the highlight of that book. In fairness, it’s not a terrible story, given that Armstrong is so slovenly a character that he’s usually fun to read. 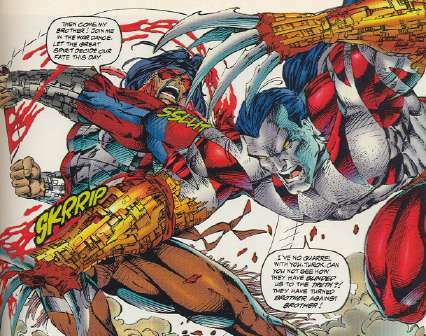 The most infamous issue was, as I recall, the one that was the most delayed, Deathmate Red . I believe it was also returnable, at least partially, as well, making it the hardest to find. Though why you would want to find it is beyond me…it’s Youngblood and Bloodshot, with Rob Liefeld at the helm for at least the first half, and you can glance at this cover for a taste of its greatness. Aside from the core series, there were also variants and a “preview” issue. The preview is generally referred to as “Deathmate Pink,” and you can see a pic of it here. It’s simply a few pages from Yellow , with Shadowman sitting down and having a quiet cup of tea with Grifter. Oh, okay, not really, they’re actually fighting. “Pink” was distributed with the Diamond Previews catalog, though, according to some of the signage I still had with our copies at the shop, copies may have also been distributed with boxes of Ultra Pro comic supplies. The variants were simply gold foil editions of the books, which made the variants for Blue and Black stand out, but the gold variant of Yellow always used to make me look twice. It was just close enough to not be immediately obvious to me at the time, though looking at it now…well, the fact that the gold foil doesn’t make me sick should be difference enough. I should admit that, as I was processing the Deathmate s for disposal, I thought I’d better check the back issue bins in case the Deathmate section needed restocking. Surprisingly, we needed Blue …though seeing as how this is probably the first time I’ve checked this section is, oh, a decade, who knows when it actually sold. So anyway…so long, our backroom Deathmate stock…we barely knew ye, but I’m glad to see the back-end of you as you become someone else’s problem. Of course, with my luck, suddenly Deathmate will become red-hot again as soon as we unload all these turkeys. 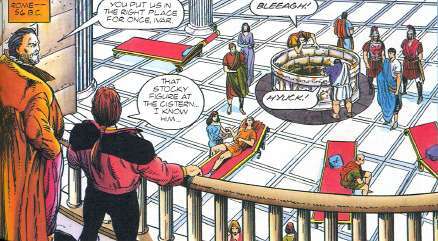 Though I shudder to think of a comics industry shift that would make Deathmate popular.